Iraq is a deserted region despite its location near two rivers, Euphrates and Tigris. It lies between latitudes 33.3333° N, and longitudes 44.4333° E.
Description about Map :Iraq, a country in western Asia, is located to the north of the Arabian Desert and covers an area of over 169, 234 sq miles. The capital city, Baghdad, is the most visited city in Iraq. The Baghdad Parade Ground, the Al Jadriya Lake, the National Museum of Iraq, the Jinub Street Park and the Al Kadhimiya Mosque are Baghdad’s biggest attractions. The Map of Iraq depicts other important tourist attractions of the country including the Great Ziggurat of Ur, the Great Mosque of Kufa, the Wadi al Salam, the Great Temple of Hatra, the Al Askari Mosque, and the Arch at Chosroes Ewan. The official flag of Iraq has three horizontal lines” red, white, and black. Takbir is written at the center of the flag which means Allāhu Akbar. It was adopted on January 22, 2008. The modern-day Iraq was known in ancient times as Mesopotamia. The great rivers of Euphrates and Tigris often overflowed and flooded the area between them, providing arable fertile land, which gave birth to the world's earliest civilizations. The first great civilization that rose in the region of Iraq was the Sumerianin 4000 BC. They were the first people to develop the world's first form of writing, which was the cuneiform. They were also among the pioneers of agriculture. The Sumerian Kingdom ended with the rise of the Akkadian Kingdom in the 24th century BC. This was followed by the rule of the Akkadian-speaking Assyriansthat lasted until 1750 BC. The Babylonian Kingdom, headed by Hammurabi, took over and briefly rose to prominence, but slowly declined with the king's death. Eventually, the region went back to Akkadian hands in 12th century BC, and back to the Assyrians in 7th century BC. Over the next 1000 years, the region was conquered and ruled by several other kingdoms. In 637 AD, the Arabs came and spread Islam to the region. They ruled for fivecenturies and their rule ended with the arrival of the Mongols in 1258. In 1538, the region came under Ottoman rule, which lasted until the World War I. On November 11, 1920, the region came under British control, naming it the State of Iraq. The Great Iraqi Revolution also began in the same year. In 1921, the Kingdom of Iraq was founded under British administration. The first king was declared in the name of Faysal, son of Hussein Bin Ali. The revolution against Britain led to Iraq's independence in 1932. The freedom was short-lived as Britain reoccupied Iraq during the World War II. In 1958, a military coup, known as the '14 July Revolution', overthrew the monarchy and Iraq was declared a republic. General Saddam Hussein rose to popularity in the 60s and he was one of the notable figures involved in the Iran–Iraq War (September 1980 to August 1988), which was one of the longest conventional wars. In 2003, US-led coalition force invaded Iraq (March 19 to May 1 2003) with an objective of disarming Iraq of weapons of mass destruction and ending Saddam Hussein's regime. In January 2005, the first elections took place since the invasion and a new Constitution was approved in October. After the Saddam Hussein government was toppled in 2003, an insurgency emerged to oppose the US forces. Between 151,000 and 600,000 Iraqis were killed in the first few years of conflict. The US withdrew from the country in 2011, but the insurgency and civil unrest continued. Although the muslim leaders around the world have condemned the ideology of ISIS, the Al-Qaeda splinter group continues to perpetrate crimes and launch attacks on Iraq to get closer to their goal: to establish a caliphate in Iraq. The group captured Mosul in June 2014 and continued to expand its territory. Currently, it rules an area that's larger than the UK. Iraq is located in Western Asia. It is bordered by Turkey to the north, Saudi Arabia to the south, Iran to the east, Syria to the west, Jordan to the southwest, and Kuwait to the southeast. Located on the north of the Persian Gulf, Iraq has 58km-long coastline. While the area between the rivers Euphrates and Tigris has fertile plains, mountains dominate the entire northeast Iraq along the borders with Iran and Turkey The desert terrain is found in the southwest and central provinces along the borders with Saudi Arabia and Jordan. 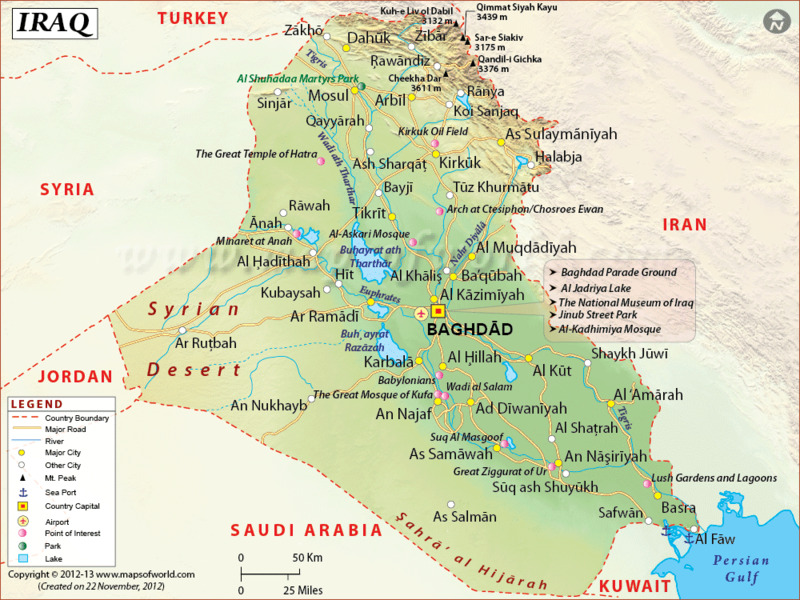 The nation's territory includes the Mesopotamian Alluvial Plain, the eastern part of the Syrian Desert, and the northwest end of the Zagros mountain range. Iraq is a democratic, federal parliamentary Islamic republic with three branches of government: legislative, executive, and judiciary. The Prime Minister and the President exercise executive power, while the Council of the Representatives and the Federation Council exercise legislative power. The last few decades of warfare in Iraq have had a devastating effect on its tourism industry. Many ancient ruins have either been destroyed or vandalized, but some are still well-preserved for travelers to explore. Despite the unrest, the country is visited by about two million tourists every year. The Kurdish region of Iraq is opening its doors to visitors as it is the safest place to travel in Iraq. The city of Babylon, located 85 km south of Baghdad in the town of Hillah attracts a large number of tourists. Built in 2300 BC, Babylon was once the playground of King Nebuchadnezzar II, who had winter and summer palaces in the city. In the 1980s then Iraqi President Saddam Hussein had his summer palace built on a hill overlooking the ancient city. Today, many monuments and ruins are replicas of the original structures such as the popular Ishtar Gate. The Lion of Babylon and Hussein's abandoned summer palace are among the top attractions in Iraq. Hatra, a UNESCO World Heritage Site, is the city of the Sun God. The fortification was the first Arab kingdom capital, and boasts of Hellenistic and Roman architecture, as well as Eastern decorative features. The port city of Basra is called the "Venice of the East" because of its abundance of parks and lagoons. The 2nd largest city of Iraq was the home of Sinbad the Sailor. The Sinbad Island ss one of the major landmarks for tourists. The Ziggurat of Ur, built sometime in the 21st century BC is the most distinctive architectural inventions and one of the biggest and best-preserved structures of Mesopotamia. The oil export industry, which dominates the Iraqi economy, provides about 95% of foreign exchange earnings. However, it has not been able to generate enough employment to reduce the unemployment rate that hovers between 18% and 30% . Before US occupation, Iraq prohibited foreign ownership of indigenous businesses and imposed huge tariffs to keep out foreign goods. It was only after 2003 that the government started taking baby steps to privatize Iraq's economy. Education is compulsory in Iraq until the 6th grade. Students have to appear for an exam to evaluate whether they are eligible to continue to the upper grades. Boys and girls are separated in the 7th grade and those who do not clear the exam are given the option of continuing their education with vocational training. The top universities of Iraq are the University of Dohuk, the University of Baghdad, and the Babylon University. Iraq has the 2nd largest oil reserves in the world. A clay tablet, considered as "the earliest known map" was unearthed in 1930 during the excavation in Iraq. According to a new study, most Brits are descendants of farmers who left modern-day Iraq 10,000 years ago. It is believed that the the fear of black cats was invented in Iraq. Before 2003, the Baghdad Zoo was the largest zoo in the Middle East and was home to more than 600 animals. What is The Arbaeen Pilgrimage?